Duvall Drake Phillips was born in Mason County, Kentucky on May 1, 1822 to Gabriel and Fanny (Cooper) Phillips. Raised on family farms in that state, and later Missouri, he followed his father into farming. He married Amelia Ann Kennedy in May 1843 and had his first child, George Washington in 1845. Amelia passed away during the birth of their second son, Gabriel Duvall, after four years of marriage in 1847. Despondent, he joined the Third Regiment of Mounted Volunteers in March 1847. Although he served during the Mexican War, he escaped with no wounds though he fought in many engagements. Returning home to Missouri, he and three cousins started for California in the Spring of 1849 finally reaching reaching Gold Country that fall. After mining unsuccessfully for several years, he began the construction of dams, tunnels, canals and flumes. There, he met and married the widow Mary (Terry) McCloud and they moved to Healdsburg in 1856. D.D. and partner Samuel Heaton purchased a total of 137¼ acres from the original Land Grant Pina family for $1112.82½. Devoting many acres to field crops as well as vineyards and tree crops, they later divided the property into equal parcels of 68 acres. D.D. separately purchased another 156 acres in 1870 from John Frisbee and William Patterson for $300. Field crops were slowly planted to fruit trees and grapevines. Early state records, listed in the “History of the Sonoma Viticultural District” by Ernest Peninou, note that by 1880, D. D. Phillips had 88 acres of “improved” farm land that included 18 acres of winegrapes. In 1891, the acreage had increased to 30 acres that were planted to Zinfandel. By 1893, the acreage had increased again to 45 acres. 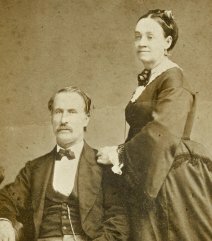 With his new wife, their first-born son Philip Walton* and Mary’s young son, William S. McCloud, D. D. began making a life and living in the Dry Creek Valley. They settled into the Piña Adobe and soon other children were born: Samuel Edmund “Ed” (1857), Oscar Frederick “Fred” (1858), Horace Hugh “Hugh” (1860), Henry (1861, died in infancy), Oliver Clarence “Clarence” (1863), and Mary (1867, also died in infancy). Arriving in California in 1865 at age 18 was Gabriel Duvall “Duvall”, D. D.’s second son from his first marriage. Interestingly, all of D. D.’s sons except for his first born (maybe with the name George Washington Phillips that is understandable) went by their middle names: Duvall, Walton, Ed, Fred, Hugh, and Clarence. 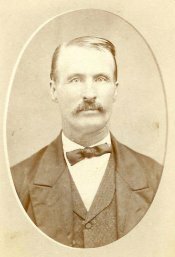 Three of Duvall Drake’s sons died young: Hugh in 1889, Duvall (a farmer in DCV) in 1890, and Clarence (a policeman in San Francisco) in 1901. George W., D. D.’s eldest son, moved from Missouri to California in 1906, and became a Justice of the Peace and a well-known and respected community leader. After D. D.’s death in 1904 the property passed to his wife, Mary. Within a year of Mary’s death in 1907, the three remaining “California” sons (Walton, Ed, and Fred), divided the property equally. Ed retained the adobe and northern parcel, Walton received the middle parcel and Fred chose the southern parcel as perhaps the best suited for agriculture. Oscar Frederick Phillips was in charge of the ranches at the time of his father’s death on June 2, 1904. D.D. was a steadfast Democrat and served as constable (of Mendocino Township in 1869), supervisor and assessor (of Sonoma County in 1879). He was an active politician, charter member of the Sotoyome Lodge, F&AM, of the Mexican War Veterans and of the California Society of Pioneers.